Providers fear LI ratepayers may be hit with part of the cleanup costs when the state starts to regulate the chemical 1,4-dioxane. Long Island water providers say an estimated $840 million price tag to add treatment systems to 185 drinking water wells contaminated by 1,4-dioxane — a chemical the state is expected to regulate this year — could lead to a spike in water rates. The cost estimate, released by the Long Island Water Conference ahead of its meeting Thursday, is significantly higher than the $317.7 million released by the state Department of Health in December. The health department had identified 89 wells statewide, 82 of which are on Long Island, where 1,4 dioxane was found at concentrations higher than 1 part per billion, the level recommended by a state drinking water quality council panel in December. The additional cost estimate, plus $30 million in annual operation and maintenance costs, could cause water rates to double, according to water providers. They are asking for state aid and a delay on when the state would start enforcing a standard for 1,4-dioxane. The chemical 1,4-dioxane, designated by the U.S. Environmental Protection Agency as a likely human carcinogen associated with liver and kidney damage, is the top concern of drinking water providers because it has been found widely on Long Island, and is not removed through conventional treatment methods, water providers said. The man-made chemical is found in industrial solvents and in trace amounts in cosmetics, detergents, shampoos and other home care products. Environmentalists and health advocates said the state should implement the new standard for the chemical as quickly as possible to protect the public. Dennis Kelleher, a spokesman for the Long Island Water Conference and executive vice president of Melville-based H2M architects + engineers, said the new cost estimate is higher than the state's because water providers start treating wells before contamination reaches maximum levels. The new estimate also includes smaller water districts on Long Island not captured in the original survey, and treatment for the chemical, which is proving to be expensive. Representatives from the Long Island Water Conference, a coalition of more than 50 water suppliers and industry representatives, are meeting with state and local lawmakers and state government officials Thursday at the Suffolk County Water Authority's education center in Hauppauge to ask for additional state aid and a delay in when they have to meet the standard and to propose banning 1,4-dioxane from household products. Treatment systems are expensive and most are still waiting for state approval. Only one system statewide - a Suffolk County Water Authority system in Central Islip - has been approved. Other systems, including a $2.8 million system installed by Bethpage Water District, are still being tested. The water authority, which provides water to 1.2 million residents, estimated at least $50 million in immediate costs to treat wells where 1,4-dioxane levels are at or above the 1 part per billion recommended by the state water panel. "These are tremendous costs. This could create rate shock," said Jeff Szabo, the authority's chief executive officer. In 2018, 38 of the authority's roughly 600 drinking water wells tested at levels above 1 part per billion, according to data it provided. New York State in December set aside $200 million for emerging contaminants, like 1,4-dioxane and a pair of other contaminants the state is expected to regulate this year. But Szabo said the state needs to provide more money to help water providers and remove a $3 million cap on grant awards for each water provider. "The funding that's been allocated won't be enough to address contamination," he said. "The cost burden will be picked up by ratepayers." State Sen. James Gaughran (D-Huntington), who had been chairman of the Suffolk water authority until this year, said the state's investment was a "down payment" on future costs. He hopes the state approves a similar amount for water programs this year. "The costs are so astronomical. This is a total game-changer for the industry," he said. Asked about the cost estimate, Brad Hutton, deputy state commissioner of public health, said the state's $200 million fund for emerging contaminants is the most of any state in the nation. Gov. Andrew M. Cuomo's proposed 2019-20 budget being debated in Albany includes another $500 million for clean water projects, though that includes stormwater, sewer and other drinking water projects. “It remains to be seen how many systems will need treatment and what the costs will be,” Hutton said. Szabo said it's too early to predict what a rate increase would look like, but said 1 percent rate increases generate roughly $1.2 million in additional revenue. It would take a 42 percent rate increase to raise $50 million. Average residential water bills are $410 a year for Suffolk authority customers, who use 160,000 gallons. Kelleher said water rates, without additional state help, could double in some water districts where multiple wells are contaminated. While the Suffolk authority and at least 10 Nassau County water providers have sued chemical manufacturers and distributors to recoup treatment costs for 1,4-dioxane, the litigation could take years to settle. There's no direct federal funding available for water projects, though the federal government funds a state account used for a loan program. 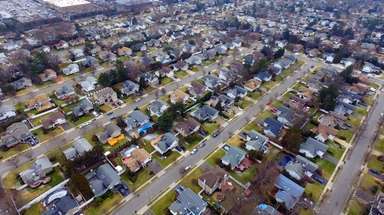 The Long Island Water Conference survey found contamination at about 185 wells at 0.5 parts per billion, a lower standard than the state used to come up with its cost estimate. Water providers generally start planning to treat water when contamination reaches half the regulatory standard. Kelleher called for the state to give water providers more time to meet any possible new standard — at least three years, rather than the 18 months other standards had been set at in the past, given costs and a potential shortage of qualified design professionals and engineers. Judith Enck, a former EPA regional administrator and now a visiting professor at Bennington College, Vermont, called a suggested delay "wildly irresponsible. The regulatory agencies are slow enough. What are you going to say, drink contaminated water for a longer period of time?" She added, "If it's expensive to treat, I’d argue it’s more expensive to have more illness and more suffering among the people on Long Island." Hutton said the state is looking at announcing a recommended drinking water standard "very shortly," which will be followed by a two- to three-month public comment period. The department expects the standard to become enforceable in 12 to 18 months after final approval, but the state health department would be willing to speak with a water system that believes it would take longer, Hutton said. Amid concerns the federal EPA would not set drinking water standards for new contaminants, New York State passed a law in 2017 establishing a Drinking Water Quality Council to set levels for three emerging contaminants of increasing concern to health experts: perfluorooctane sulfonic acid (PFOS), found in firefighting foams; perfluorooctanoic acid (PFOA), used in the manufacture on nonstick and stain resistant products, and 1,4 dioxane. PFOS has been found at Gabreski Air National Guard Base in Westhampton Beach and a Suffolk fire training center in Yaphank, and both have been named state Superfund sites. Two public water supply wells near the Hampton Bays Fire Station were closed when the chemicals were detected, while PFOA and PFOS were found in more than 150 private wells in Wainscott, near the East Hampton Airport. PFOS also has been found at Brookhaven National Laboratory in Upton. The state health department estimated that to regulate PFOA and PFOS at 10 parts per trillion, the amount recommended by the panel, statewide costs would be $855 million in capital and $45 million in annual operating costs. The Long Island Water Conference did not estimate Long Island's share of the cost to regulate PFOA and PFOS, which can be removed with traditional treatment methods. Chronic, lifelong exposure to 0.35 parts per billion of 1,4-dioxane represents a 1-in-a-million cancer risk, according to the EPA. In December, the panel of state health and environmental officials, water providers and academics recommended a drinking water standard of nearly three times that — 1 part per billion for 1,4 dioxane. The drinking water quality council considered the stricter standard of 0.35 parts per billion, but some members, including representatives of water providers, opposed setting it at that level because of the cost. Still, other panel members said the standard of 1 part per billion was protective of public health. "I have to say I was born on Long Island. I have family on Long Island and I have four grandchildren on Long Island," panel member Joseph Graziano, a professor of Environmental Health Sciences and Pharmacology at Columbia University, said at the December meeting. "I'm comfortable with the 1 part per billion." Harold Walker, a professor of environmental engineering at Worcester Polytechnic Institute and a member of the drinking water quality council, said, "I think the overall result of the council is a really solid number that’s very protective of public health." The panel's water standard recommendation is with state health department Commissioner Howard A. Zucker. Hutton said the recommendation will "absolutely" come out before this year, and possibly before this summer. Water providers and environmentalists expect the standard to be set at the 1 part per billion, which Cuomo touted as a level that would be the most protective in the nation. A handful of wells with high detection levels have been taken offline in the past couple of years, while other wells are only used during peak summertime demand, water officials said. Other contaminated wells are "blended" with cleaner water, where possible. A Suffolk Water Authority well in East Farmingdale with 1,4-dioxane detection at 19.9 parts per billion was taken offline in February 2018. A Hicksville Water District well with 1,4-dioxane detection at 33 parts per billion, the highest in the nation during a 2013-15 national survey of wells, was taken offline in 2016. But water providers said most wells with contamination levels above the recommended level have remained in use. The Water Authority of Western Nassau County, which serves 120,000 people at Elmont, New Hyde Park, Floral Park and other nearby areas, has one site with two wells that tested at 2.6 parts per billion and 19.2 parts per billion in December. The authority is studying treatment options, but the wells are necessary to keep water flowing, said Michael Tierney, superintendent of the water authority. If they shut down, "We wouldn’t be able to deliver water in that area. We wouldn’t be able to keep up with demand," he said. Treating 1,4-dioxane, a likely carcinogen set to be regulated by the state this year, is especially difficult and costly. Only one system, in Central Islip, has been approved for use in New York, though others are being tested. Removing 1,4-dioxane involves mixing contaminated water with a chemical like hydrogen peroxide. 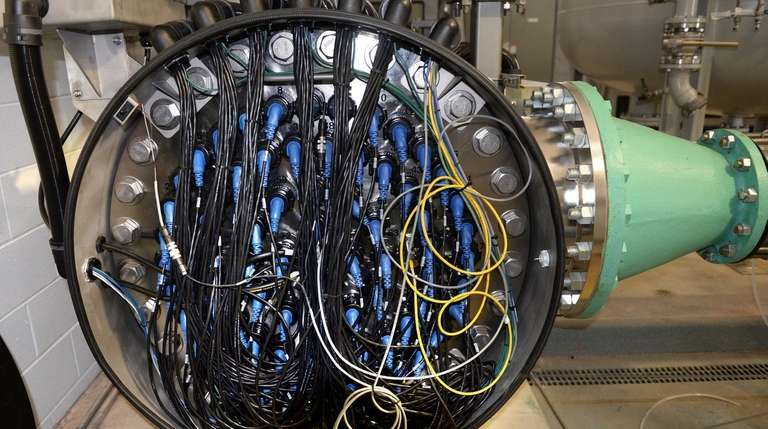 The water is then blasted with UV rays from dozens of light bulbs inside a system. The water then filters through a pair of tanks filled with 20,000 pounds of granular-activated carbon. Cost estimates for the treatment, known as advanced oxidation process, vary. Suffolk's water authority said its system in Central Islip cost $1.2 million, but the location already had a building and carbon filtration system for other contaminants on-site. 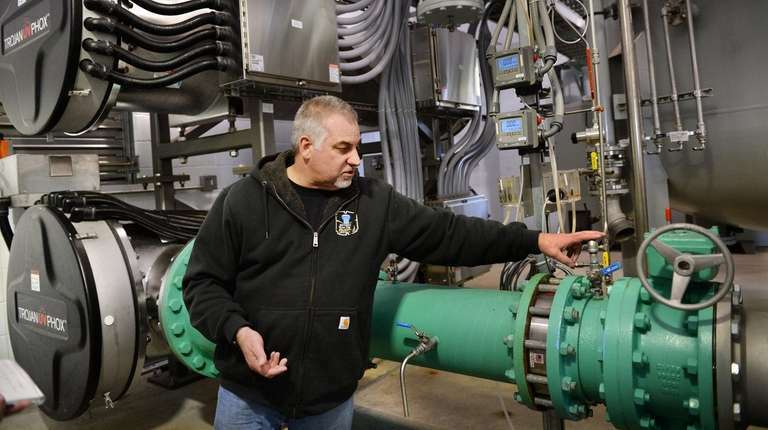 A pilot system at Bethpage Water District cost $2.8 million. The Long Island Water Conference said with design costs and if new buildings are required, future systems could cost in excess of $4 million.